The changed political landscape in the wake of Wednesday’s general election will have a limited impact on the Korean stock market, analysts here said Thursday. The benchmark Korea Composite Stock Price Index rose 1.34 percent to trade at 2007.77 as of 2 p.m. Thursday on China’s better-than-expected March trade data and gains on global stocks the previous day. The tech-heavy KOSDAQ inched down 0.24 percent to mark 691.78 at the time. The analysts said the National Assembly would lose steam in its push for the passage of a set of economic and labor reform bills proposed by the ruling Saenuri Party as the political group lost its parliamentary majority status. “The Assembly to be under the control of opposition parties is likely to put the brakes on those bills,” said Lee Jae-man, analyst at Hana Financial Investment. Such bills aim at relaxing regulations in the services industry and reforming the labor market. Quantitative easing, an idea floated by Saenuri Party’s chief campaigner Kang Bong-kyun to allow the central bank to purchase industrial finance bonds and mortgage-based securities to boost the economy, will lose its political support as well, Lee said. “However, this impact will not be big enough to move the overall stock market,” he said. “The rise in KOSPI is attributed to strong foreign buying on global stocks’ overall gains on Wednesday, not to the elections results” he said. The benchmark index is likely to walk sideways because there are not many positive factors that can push up the index to the next level in the near future, he noted. 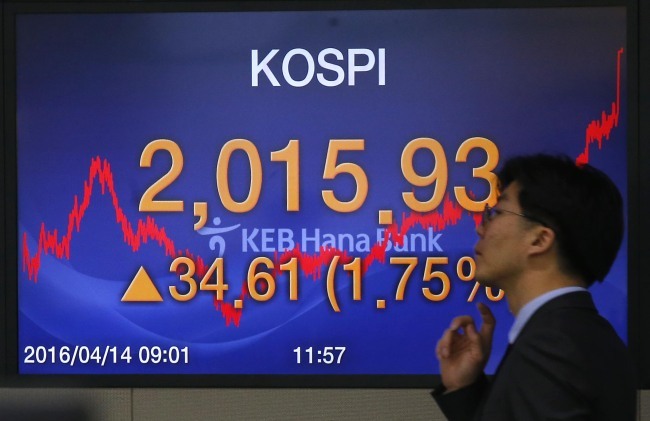 Cheon Se-ung, an analyst at KR Futures, shared Lee’s view. He expected that the index will move between gains and losses in the 1,976-1,987 levels this week. Gains will be buttressed by an eased worry over the U.S. Fed’s possible rate hike but weakened yen and declines in oil prices will limit the upward trend, he added. Some shares of companies that are related to political bigshots fluctuated depending on the elections results. Shares of AhnLab, a security software provider, jumped 5.26 percent to trade at 74,000 won as of 2 p.m. Thursday, boosted by the win of its founder and largest stakeholder Ahn Cheol-soo, who leads the opposition People’s Party. Textile company Chonbang, whose honorary chairman is the elder brother of ruling Saenuri Party chairman Kim Moo-sung, saw its shares plunge 19.23 percent to hit 42,000 won as of 2 p.m., on Kim’s defeat. On the KOSDAQ, local online game developer Webzen’s shares traded at 24,250 won as of 2 p.m., 1.46 percent higher than Wednesday, following the victory of its ex-CEO and current board chairman Kim Byung-kwan, who secured a main opposition party seat.